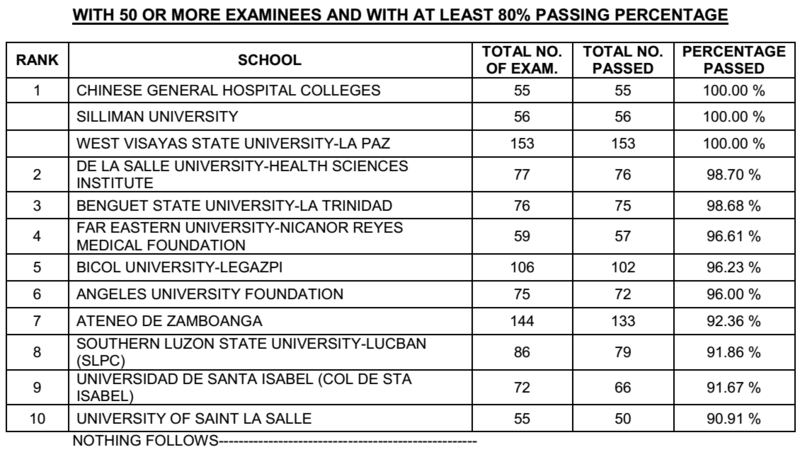 The Professional Regulation Commission (PRC) on Tuesday, June 23, 2015 named Chinese General Hospital Colleges, Silliman University and West Visayas State University - La Paz as the top performing school in the May 2015 nurse licensure examination (NLE) or nursing board exam for having 100 percent passing percentage. PRC announced that 9,707 out of 17,891 passed the Nurse Licensure Examination given by the Board of Nursing in the cities of Manila, Bacolod, Baguio, Cabanatuan, Cagayan de Oro, Cebu, Dagupan, Davao, Iloilo, Laoag, Legazpi, Lucena, Pagadian, Tacloban, Tuguegarao and Zamboanga last May 2015. Here's the complete list of top performing schools in the May 2015 Nurse Licensure Examination (NLE) or nursing board exam as per Commission Resolution No. 2010-547 series of 2010: WITH 50 OR MORE EXAMINEES AND WITH AT LEAST 80% PASSING PERCENTAGE.